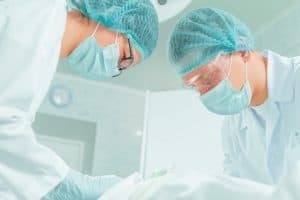 Many times patients find themselves with unwanted, unsightly scars after abdominal surgery of all types, including cosmetic procedures such as liposuction and tummy-tucks, cesarean section deliveries, abdominal surgery performed for non-cosmetic medical reasons. The appearance is often made worse by stretching during pregnancy. Dr. Mauricio Giraldo of the Advanced Liposuction Center in Cranberry, PA, can explain how to get rid of scars. He has performed many abdominal scar revision procedures and regards them as a relatively simple outpatient procedure with an extremely safe track record. Sick of your unsightly scars? Scar revision surgery may be right for you. Call The Advanced Liposuction Center today at (724) 683-7581 to schedule your free consultation. During your consultation Dr. Giraldo will make recommendations based on the location, type, and severity of your abdominal scars. In more severe cases the scar tissue must be surgically removed and edges of the incisions carefully rejoined to minimize future scarring. In less severe cases the scars can be re-orientated by pulling and anchoring the skin. This places them in existing skin folds where they’re less visible. In the least severe cases surgery may not even be necessary—specialty dressings such as sheet silicone can be applied to reduce the scar’s appearance by encouraging more complete healing. Another increasingly popular option in less severe cases is laser scar reduction. Multiple treatments will be needed, but this type of scar revision can be extremely effective. Another method is dermabrasion or dermal planning, which simply remove the topmost layers of the skin, thus physically removing a great deal of the scar tissue. Both of these techniques are non-invasive yet can achieve very good results. What’s the bottom line? If you’ve got an abdominal scar your unhappy with, Dr. Giraldo probably has an option which can dramatically reduce the appearance of your unwanted scar, in some cases more than 90%. After many of these procedures the treated scars are barely visible after about 6-8 weeks. For many patients this can mean the difference between feeling comfortable in a swimsuit (or less) and feeling as if they have to hide their abdomen. After their procedures, many patients happily report a level of self-confidence that they haven’t felt in years! How are belly-button and scar revision procedures performed? These procedures can be performed together or separately. Dr. Giraldo uses local anesthetic for this relatively simple in-office procedure. Belly-button repair usually takes about an hour. The first and usually primary goal is to reshape the belly-button, restoring a rounded, natural look. Often this involves removing tiny flaps of skin to tighten the navel, which are made inside the navel itself to avoid further scarring. Another goal is altering the size and shape of existing scars, which can be accomplished with a number of techniques. The incisions used are very small, which means that there’s little downtime. Patients can usually return to work within 24 hours. While the incisions heal they must avoid activities which strain or put pressure on the abdominal wall, such as heavy lifting or bending backwards: this normally occurs within 2-3 weeks. Aside from this, normal activities can be resumed, including exercise which don’t strain the area such as running and biking. This procedure is extremely safe. While any incision can potentially become infected, this is very rare and in almost call cases resolves without further complication. As with any cosmetic procedure there is likely to be some swelling, bruising, and discomfort, but these tend to be minimal. If needed patients can take over the counter pain medications, but in many cases not even these are required. When it comes to unsightly abdomens, most people think of excess fat around the middle, love handles, and sagging skin. Not as many people think about the appearance of the belly-button, but perhaps they should: it’s at the center of the abdomen, and a nicely shaped “innie” can really add to a nice flat set of abs. Yet for many of us, especially those who have undergone older liposuction procedures in the past, this isn’t the case. The navel can have an overly-round “O” shaped appearance, have visible scarring, or even the dreaded “outie” look. In other cases, an unsightly belly-button can be the result of weight gain, weight loss, pregnancy, or less-than-perfect tummy tuck procedures. A decrease in the size of the navel due to the contraction of the incision used to perform a liposuction or previous tummy-tuck procedure. This is known as umbilical stenosis. A belly button with a long, thin, stretched-out appearance. A large, distended “outie” belly-button. Excessive scarring in and around the belly-button. An uneven, asymmetrical, or large scar. Fortunately, there’s help. Dr. Mauricio Giraldo at The Advanced Liposuction Center in Cranberry, PA has performed hundreds of umbilical revision surgeries. This is an outpatient procedure that is much less involved than a tummy-tuck or liposuction, and can often be performed in about an hour. So whatever the cause of your less than stellar belly-button, a gently curved, “innie” look is now within your reach. Our initial consultations are always complementary, and you’ll learn what it will take to achieve the look you want by the minimally invasive method possible. Call today for your consultation—The Advanced Liposuction Center (724) 683-7581. Says Dr. Giraldo, “I get asked a lot if a tummy tuck scar should be made above or below scars from a C-section delivery. It’s like they assume that there’s going to end up with two scars. That’s not how I do it. 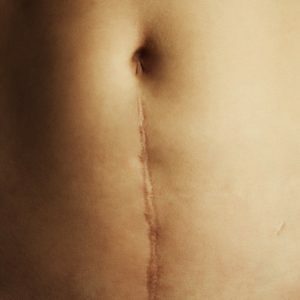 I do make my incision below the C-section scar, but then I’m able to blend the tummy-tuck scar into the existing scar, and often I can then even reduce its appearance. It’s actually a pretty good situation to be in. They’re only left with one scar, and depending on what type of skin they have it’s often not even visible. I also use sutures—never staples. It’s much better for scarring. I love doing this type of procedure when a C-section scar is involved, patients are very happy about this. And when they’re happy, I’m happy! What is the best approach to treating unsightly abdominal scars? The best approach to How to Get Rid of Scars is usually a multi-part approach. 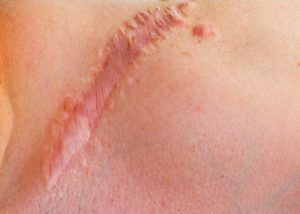 In more severe case a scar may need to be excised (surgically removed). Once removed, the edges are carefully rejoined to minimize further scarring. In less severe cases the scar can be re-oriented. It can be reshaped by pulling the skin tight and anchoring it in position. Using this technique it is often possible to camouflage the scar by positioning it in an existing skin crease. For very minor scars surgery might not be necessary. Options such as silicone sheets and gels can drastically minimize the appearance of an unwanted scar when applied over a period of time. Skin resurfacing lasers can often virtually eliminate minor to moderate scars. Multiple treatments are necessary, and are administered 3-4 months apart to allow for adequate healing. Dermabrasion can treat superficial scars by essentially removing the top layers of skin which contain them. This is another completely non-invasive method which can prove quite effective when used in the right situations. Should I let a scar heal on its own before getting it treated? What can I expect from scar reduction cosmetic procedures? Put simply, you should expect for the scar to become much less visible. In many cases patients achieve a greater than 90% improvement. Often it’s barely possible to see the original scar after at all after scar reduction surgery.